BRUSSELS, Belgium, March 17, 2011 (ENS) – A Belgian court today handed suspended jail sentences to 10 Greenpeace climate activists who peacefully protested at a European climate meeting in December 2009. The activists each received a one month jail term, suspended, and fines of €1,100 (US$1,540). Greenpeace condemned the verdict as disproportionate and is considering appeal. Under the Belgian penal system, a one month jail sentence may not result in imprisonment, but the penalty will remain on the demonstrators’ records. On December 10, 2009, Vandenheede and other Greenpeacers drove up to the door of the European Council building where media were gathered and EU officials and heads of government were arriving for the summit meeting being held to prepare for the UN’s climate summit in Copenhagen, Denmark. 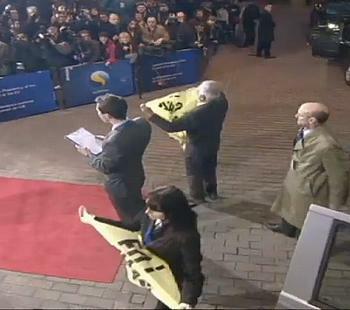 Stepping onto the red carpet laid out to welcome the officials, three activists held up banners reading, “EU: Save Copenhagen” and began to read out a message calling on politicians to save the climate before Council security men removed them. The entire incident lasted about 30 seconds. 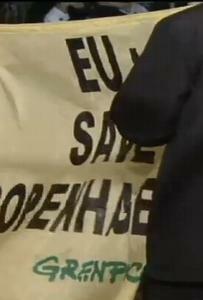 The activists were in cars displaying placards with the Greenpeace logo, and some also wore badges with their photos and names identifying that they were from Greenpeace. The court found all 10 people guilty of using false documents. One Greenpeace staff member who faced the same charge and an additional charge was found innocent by the court on all counts. He had no role in the action and was officially accredited as a journalist at the summit. Greenpeace is concerned about the increased restrictions and prosecutions relating to peaceful protest currently occurring in democratic countries that claim a tradition of free speech. Recently, Greenpeace activists have faced prosecution for peaceful actions in Denmark, Japan and Belgium. Eleven Greenpeace activists are facing trial in Denmark because of a peaceful protest outside the State Banquet at the climate conference in Copenhagen in December 2009. In September 2010 Junichi Sato and Toru Suzuki were sentenced to a one year prison sentence, suspended for three years. The two Greenpeace activists were charged following their revelations of corruption within the Japanese whaling program. In 2008 Greenpeace Belgium organized seven consecutive peaceful protests against Electrabel, to which the former state-owned power company responded by filing a criminal complaint for organized crime. The verdict in the seventh and final Electrabel case is expected shortly. Unreasonable and disproportionate prosecution of peaceful protest is contrary to international standards such as the rights to freedom of expression and assembly, Genet contends, relying on opinions of the European Court of Human Rights that the role of nongovernmental organizations is crucial to matters of public interest, such as health and the environment.